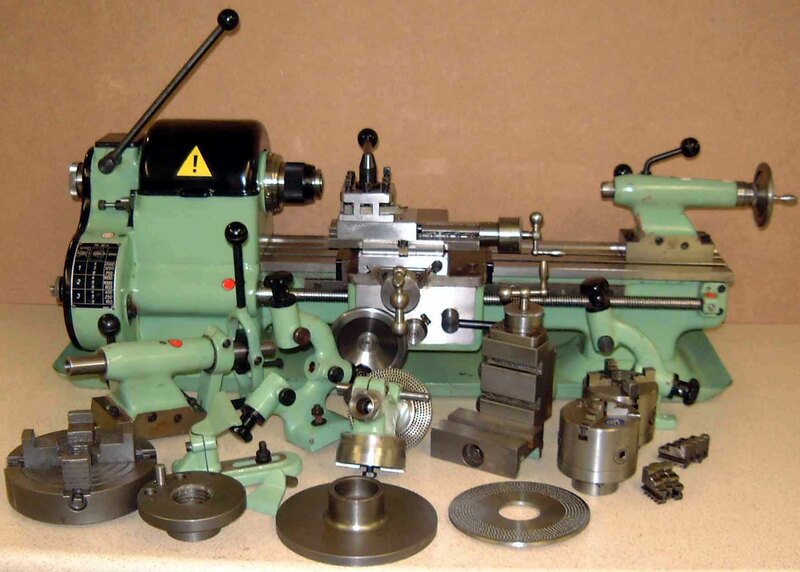 With many and diverse Companies making up its group, the Czechoslovakian TOS organisation encompassed various manufacturers who produced a huge variety of types - from miniature precision, toolroom, production and capstan lathe lathes to giant planing and grinding machines. 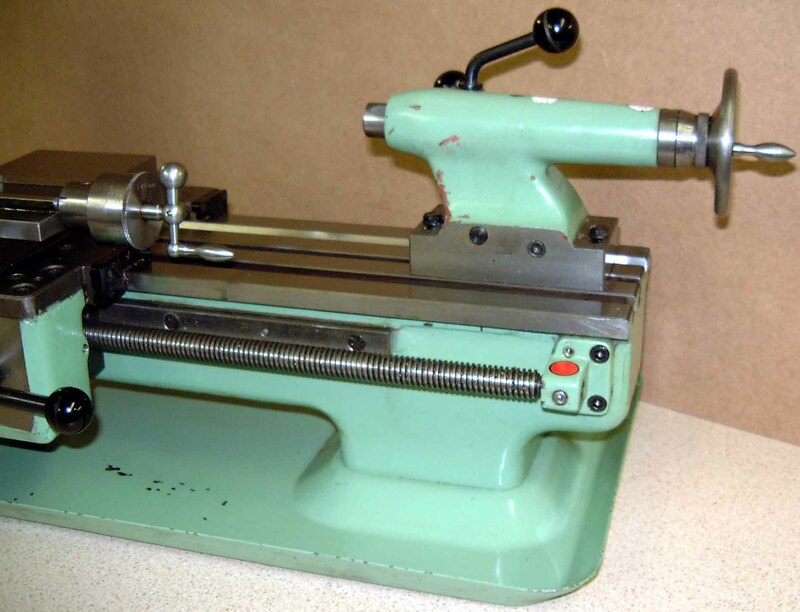 Their smallest conventional lathe was the beautiful little MN80 A/N 3" x 12" (90 mm x 160 mm) a type introduced to the UK during the late 1950s - probably in 1958. It is thought - according to the a Czechoslovakian resident whose father and grandfather worked at the factory - that the original version dates from as early as 1941. Very well thought out, superbly constructed and available with an astonishingly wide range of accessories, the MN80 was to sell widely throughout Europe. In later years an alternative version, the SU16 was offered, this having a roller-bearing headstock replacing the original bronze-bearing type together with more modern, angular styling. Both early and late models were not only very heavy (the bed alone weighing around 100 kg of the 180 kg total mass) but could be supplied complete on a magnificent oak cabinet stand that held the underdrive 0.55 kW motor and countershaft system in their left-hand compartments and with a storage cupboard on the right..
As supplied for UK use (the last batch of thirty were imported by XYZ Machine Tools in 1993/4 from the almost bankrupt CZ-Government-owned factory) the MN80 lathe had 9 spindle speeds from 150 to 2000 rpm with an optional range, more suited for screwcutting, of 75 - 2000 rpm. Fitted by the factory with 3-phase motors, ten of the XYZ machines were converted in the UK to DC drive with the rest having more up-to-date 1-phase to 3-phase inverters. 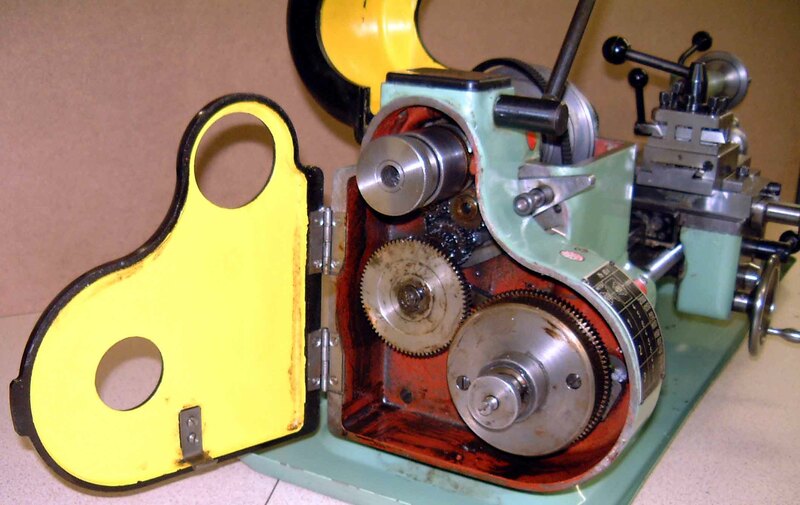 In order to provide a very fine feed, a neat Lorch-like planetary gearing system was fitted within a large drive gear on the end of the leadscrew; to engage the feeds a knob in the middle of the gear was pushed in - while to disengage them, and select a direct drive for screwcutting - the knob was pulled right out. Enormously wide, hardened (though it was not have been for some markets) and braced by a number of diagonal ribs between the walls, the bed used a pair of flat outer ways with narrow vertical guides for the saddle and a separate inner way with a central T-slot and one bevelled side to align the tailstock. With an 18 mm-bore, the headstock spindle (with a "metric" 1:20 taper) ran in plain bronze bearings with all the drive pulleys, including the large reduction pulley on the countershaft, in cast iron - the result being a useful increase in flywheel effect. 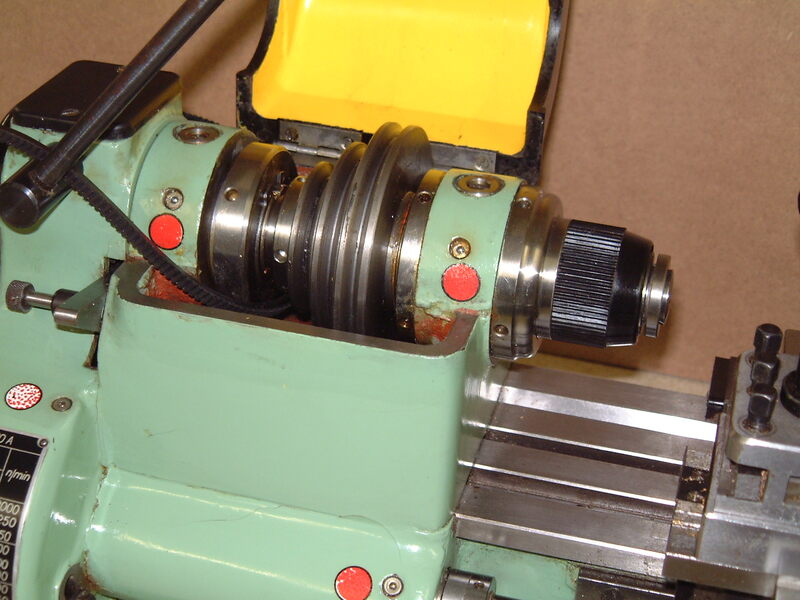 The short-travel, lever-operated collet closer was designed to be left permanently in place - if, for whatever reason, you remove it be careful not to loose the two little rollers that sit in slots cut in the end of the spindle. 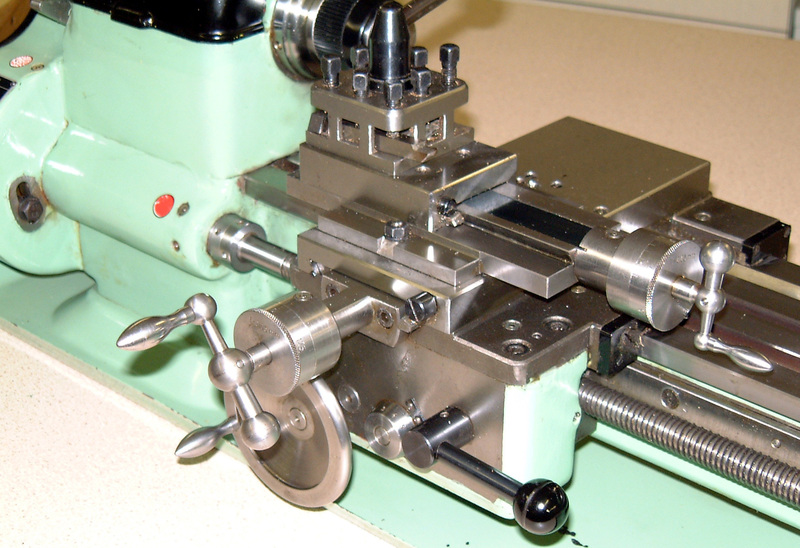 Like the very much more expensive Lorch LAS, the MN80 was unusual in offering full screwcutting in a miniature lathe format: 19 longitudinal feed rates from 0.01 to 0.15 mm per revolution of the spindle were available together with (from the standard changewheel set) 19 metric threads from 0.2 mm to 3 mm pitch; 15 Whitworth pitches from 36 to 7 t.p.i; 17 module from 0.2 to 1.5 and 8 Diametral from 20 to 80 DP. Unfortunately, unlike the Lorch, the TOS did not have a backgear so in reality the generation of threads at the lowest spindle speed (150 r.p.m.) would have been challenging for a beginner. Echoing aspects of traditional precision plain-lathe practice, most of the carriage was finished in polished bare metal and fitted with a very long travel top-slide. However, instead of the expected tiny micrometer dials, the ones fitted were of a good diameter, satin-chrome plated and engraved to a high standard; as an additional attraction the compound slide-rest feed screws were fitted with an adjustment whereby backlash could be eliminated as they, and their nuts, wore in service. The top slide was topped by a very unusual "braced" 4-way toolpost with the rectangular tool slots broached through the edges of the assembly; whilst this was undoubtedly a strong design, it did bring in its wake certain restrictions - amongst which were the difficulty of using shims to adjust the tool height and the impossibility on inserting such things as parting-off and knurling tools that had any sort of sideways projection. Unfortunately, instead of being T-slotted. the top surface of the cross slide was left plain, a fault that could not even be corrected by raiding the accessories' list. 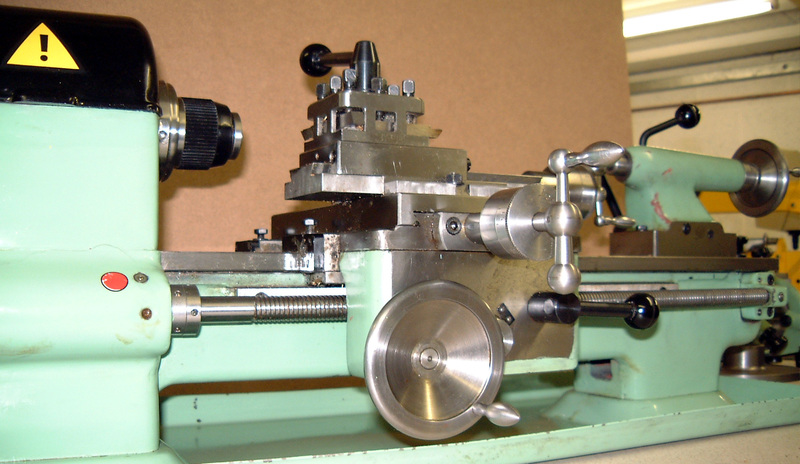 Able to be off-set on its sole plate for taper turning, the tailstock was fitted with a hardened, No. 1 Morse taper, 20 mm-diameter (self-eject) barrel with a travel of 80 mm and a useful zeroing micrometer dial. As standard (for the English market, at least) the lathe was particularly well specified and equipped: a very wide, hardened bed; built-in dial-thread indicator; tumble-reverse drive to the (Module 1) screwcutting changewheels; 19 internal collets, 5 internal and 5 external stepped collets; 3 and 4-jaw self-centring chucks, 4-jaw independent chuck; faceplate, catchplate, spare chuck backplate; fixed and travelling steadies; drill chuck, tailstock-mounted (No. 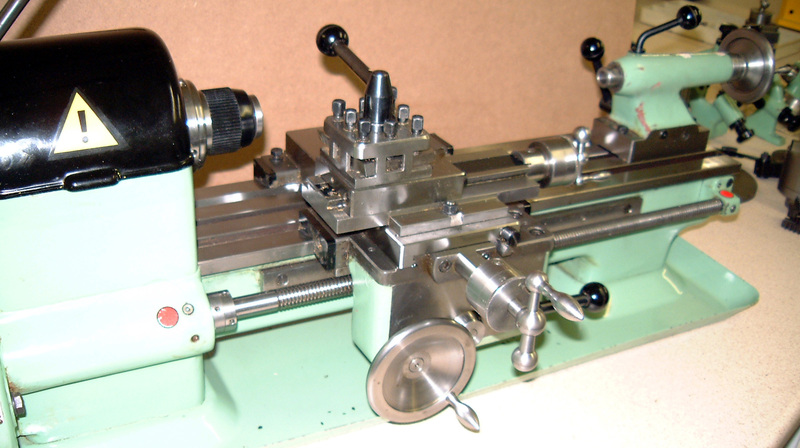 1 Morse taper) plain drilling pad; headstock-spindle dividing plate; 4-way toolpost; vertical-milling slide; an additional tailstock with lever-operated barrel; wood and plastic hand-turning rests with two lengths of T and ordinary Morse centres and a toolbox - a list that must be considered generous by any standards. 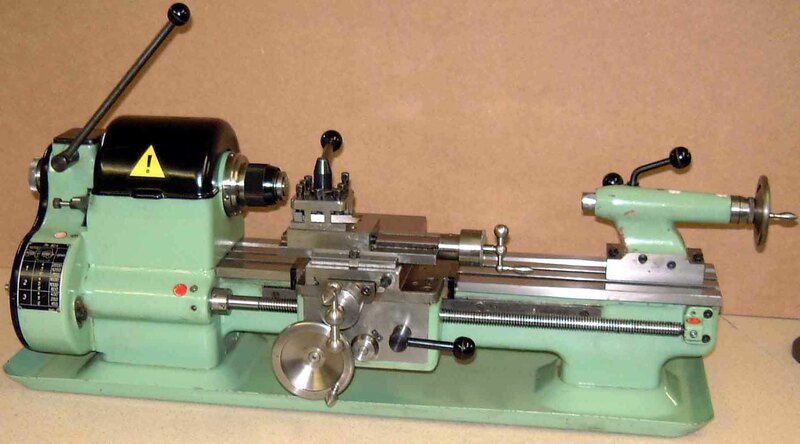 Although comparatively rare in the UK - and so with little users' experience to call upon - a first-hand report from an owner in California, a professional jeweller, indicates that this is a solid, smooth-running lathe ideally suited to fine work as well as having a generous reserve of power, capacity and strength unusual in so small a machine. 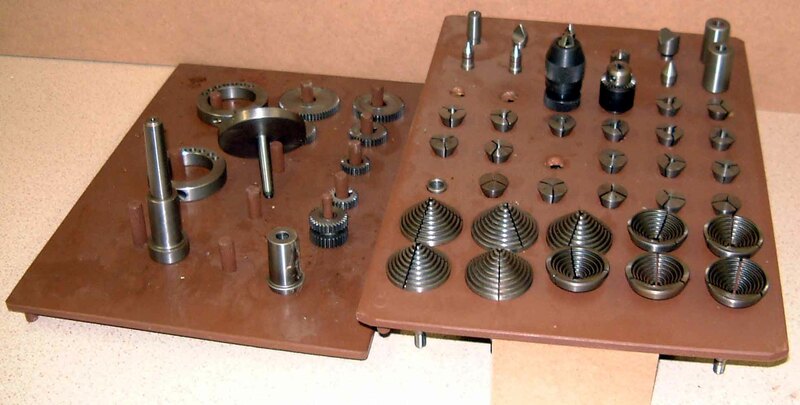 Of course, all was not perfect, and there is evidence of cost cutting in the quality of the turned finished on "cosmetic" parts of the accessories - and, if the machine had been built 40 years earlier, the spindle nose protector would have been in bronze with a nickel or chrome-plated finish - not plastic. Interestingly, the maker's attention to detail even extended to offering the lathe with a "tropicalised" finish with improved paintwork and an electrical system better able to cope with the difficulties imposed by high humidity. In the early years of the 21st century the SU16 was no longer offered at a sacrificial price - to attract much-needed Western currency - but had risen to Euro 6000 complete with a full range of accessories. However, production of the SU16 continued with the main differences being a slightly longer bed, roller bearings in the headstock and modifications to the apron where the positions of the leadscrew clasp nuts and carriage-traverse hand wheel were swapped over..
MN80 - showing the generous level of equipment provided with UK-market machines. A very strongly-built headstock - but without backgear for really slow speeds - one advantage of the earlier (and very much more expensive) Lorch LAS. The tumble-reverse mechanism was economically engineered with a spring-loaded plunger passing through the flat face of the engagement lever to locate with indents drilled into the end face of the headstock. 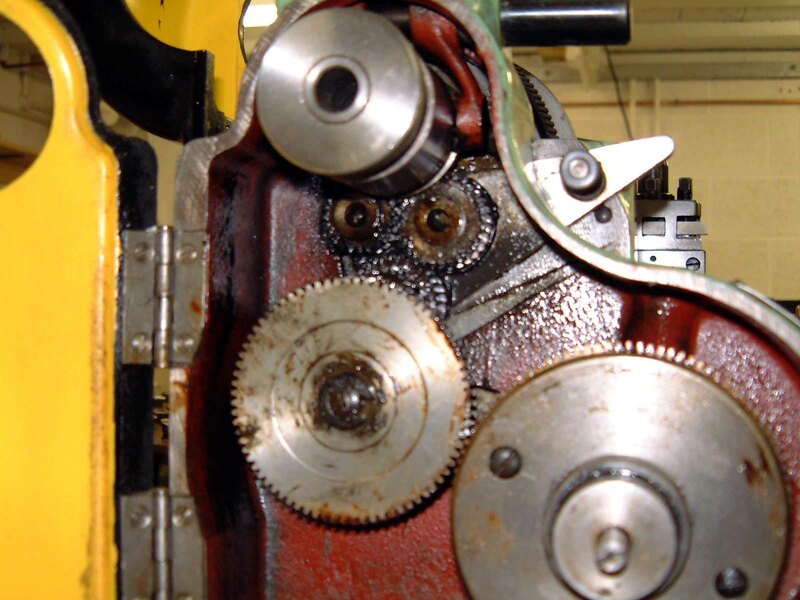 The large gear on the end of the leadscrew contained a planetary gearing system designed to provide a very fine rate of feed to the carriage. Pulled right out the knob selected a direct drive for screwcutting, pushed in it engaged the reduction gears. A well-constructed and finished carriage with large, clearly engraved micrometer dials, tapered gib strips to adjust the fit of the cross and top slides (the latter with a very long travel), a dial-thread indicator built into the front of the apron - and multiple oiling points.